Orofacial pain: a guide to medications and management (paperback) CLARK Glenn T., DIONNE Raymond A. Authors: CLARK Glenn T., DIONNE Raymond A. Add to cart the livre of CLARK Glenn T., DIONNE Raymond A. Pain is a preoccupation in dentistry, but the dentist's role has expanded beyond the treatment of dental pain to being one of the most involved in the treatment of orofacial pain. 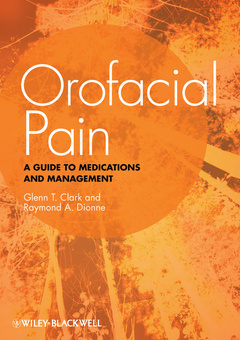 Orofacial Pain: A Guide to Medications and Management guides readers through the rational use of medications for the treatment of chronic orofacial pain, including oral, injectable and topical medications. It also provides relevant information about treatment choices for managing neuropathic and musculoskeletal pain, headache and uncommon orofacial pain disorders. 1. Chronic pain diseases that occur in the orofacial region. 2. Top 25 most prescribed medications used in an OFP Treatment Center and how to compare medications for efficacy (include NNT and NNH). 3. Metabolism of medications including liver enzymes & genetics including DDI's, ADR's, Cytochrome P450 table and pharmacogentics issues in OFP. 4. Pharmacolegal Issues (DEA/DOJ/Off Label use and Schedule II medications tracking). 5. Opioids short/long-term use and current approaches for non-malignant chronic orofacial pain. 6. NSAID, Steroids and DMARDs. 7. OTC agents, Oral rinses and Topical agents used for pain. 8. Anti-convulsants agents and pain. 10. Short term anxiolytic agents used in pain medicine. 11. Injectable agents for pain (including Botox). 14. Acute Chemo-Radiation Therapy Mucositis Prevention and Management. 15. Chronic Oral Mucositis, GVHD, Ulcerative Mucosal Pain and Bleeding associated with vesculobullous lesions. 17. Anti-Bacterial agents and their use in pain. 18. Medications as Diagnostic Tests.